Alta Badia is a great Italian ski resort, located on the sunny side of the Alps. If you’re looking to spend some quality time with your family, Alta Badia offers a range of perfectly prepared slopes that are accessible to all skiers. We’ve got all the vital information you need to know, as well as guidance on booking your transfer, with our Alta Badia Ski Resort and Transfer Guide. Shortly after World War I, Alta Badia started to develop into one of the most impressive ski regions in the Alps. Today, Alta Badia is a modern and renowned skiing destination, with impressive views and scenery that’s dotted across the Italian Alps. The region itself consists of 6 villages whose lifts are all linked together. The large village of Corvara, as well as other beautiful ski towns such as Sella Rondo and Badia, are never too far away. The Dolomiti Superski area is also easily reachable from Alta Badia and boasts 668 pistes with an additional 573 ski lifts. Flying into Alta Badia? Make sure to arrive at one of the closest airports. If you’re travelling by train, these are the closest stations to Alta Badia. The following transfer times are approximate only, as weather and traffic conditions can significantly impact the length of your journey. We take a dynamic approach to our pricing structure, meaning we won’t just offer a flat rate quote to and from Alta Badia. Instead, we take into consideration the specific circumstances of your journey to offer you the cheapest rates available without compromising on quality. All above factors will only ever result in our base-rate for ski transfers going down – we never over-inflate our prices at any time or for any reason. We also offer substantial discounts for off-peak, off-season and mid-week transfers to Alta Badia. If you’re looking to get the best possible deal, travelling outside of peak season or mid-week typically results in the biggest savings. Our midweek (Monday to Friday) prices have up to 60% cheaper rates than weekend prices. If you have any specific requirements or will be travelling as part of a larger group, please get in touch directly so we can discuss your situation. 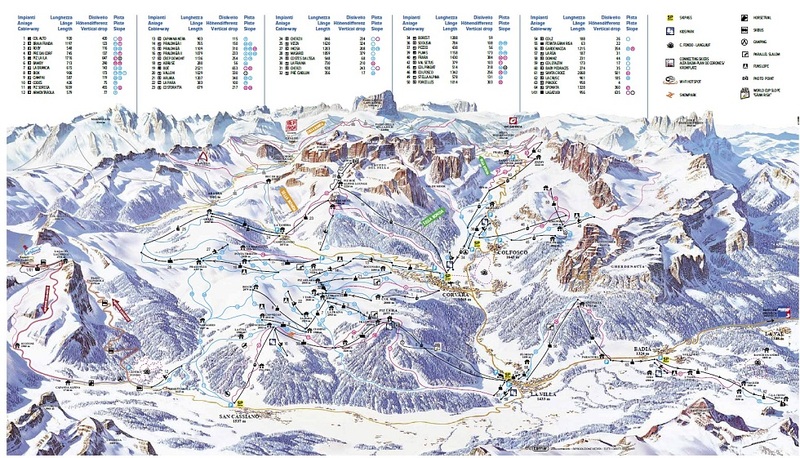 Alta Badia season opening dates are subject to snow conditions. Alta Badia sits at 1324m and features trails that range from 1350m to 2750m above sea level. Below are some more essential stats for visitors to Alta Badia. Alta Badia is a great destination for intermediate and beginner skiers as well as those with families. Alta Badia is a perfect winter ski trip for all the family. There are plenty of designated child-friendly facilities and entertainment, with well-groomed, wide and easily accessible slopes. There are also several benefits for families with kids at Alta Badia. You’ll receive a great lift pass discount if you’re a family with children less than 8 years of age, in addition to professional and fun ski schools that are designed for people of all ages. If you’re headed out to Alta Badia, these useful links will help you prepare for your trip away. Why Choose Alps2Alps for Your Transfer to Alta Badia? We’re the lowest-cost private airport transfer provider available for Alta Badia. Our vehicles are based at the airport to ensure you the best, most reliable and most punctual transfer service for the Italian resort. Be sure to book online with us to guarantee the fastest, most efficient and lowest costing transfers. If you request a service or destination which is unavailable, get in contact directly and we’ll do our best to help. We operate at the lowest costs without compromising on service, reliability or safety. Start and end your trip to Alta Badia in the best possible way with Alps2Alps.